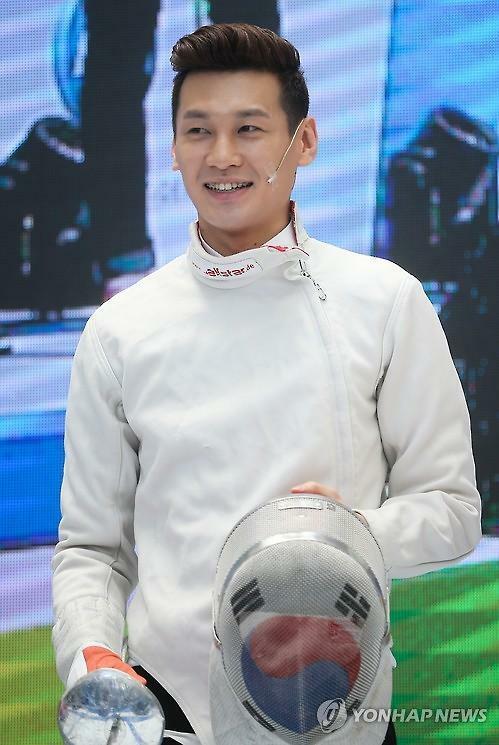 Korean fencer Gu Bon-gil has been named Korea's flag bearer at the opening ceremony for the Rio de Janeiro Olympics, the Korean Olympic Committee announced Tuesday. The KOC said Gu, who is a member of the gold medal-winning men's sabre team at the 2012 London Games, will carry the national flag at the opening ceremony for the 31st Summer Games which will be staged at Maracana Stadium in Rio de Janeiro, Brazil, on Aug. 5. Gu, 27, is currently ranked world No. 4 in men's sabre. He also has three Asian Game gold medals. The KOC also announced captains for the male and female delegations. Shooter Jin Jong-oh will serve as the men's captain, while Oh Yong-ran, the veteran handball player, will be the women's captain. Jin is one of the most decorated Olympic shooters. He won the 50m pistol gold medal at the 2008 Beijing Olympics, and followed that up with gold medals in the 10m air pistol and 50m pistol at the London Games in 2012. The 36-year-old shooter will also be the flag bearer when the Korean delegation departs from Incheon International Airport to Rio on July 27.